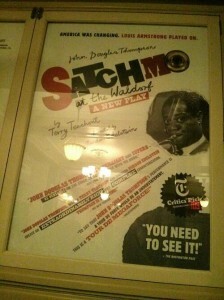 I went to see the off-Broadway production of Satchmo at the Waldorf last Friday for the first time in a month. I’m going back again next week. I expect I’ll see it two or three more times before the final performance on June 29—and that I’ll enjoy it just as much each time. Hindemith, after he wrote a piece, wasn’t interested in it anymore. He never came to hear my Marienleben; although he knew I do it very well, he said he’s not interested to hear it—he’s written it. Not me. I only got to see The Letter, my first operatic collaboration with Paul Moravec, performed three times by the Santa Fe Opera in 2009. I felt that I had to get back to my day job as a drama critic not long after The Letter opened, and I’ve regretted ever since not having taken another couple of weeks off and seeing it two or three more times. But…why? What’s the point of seeing a show of your own repeatedly, unless you’re there to give notes to the cast and crew after the performance (which in my case scarcely ever happens) or planning to revise the script (which I don’t intend to do with Satchmo)? What do you get out of going back to see a play that you already know better than anyone else? I won’t deny that part of the pleasure that I take in watching Satchmo at the Waldorf is simple pride of ownership. I made this! I sometimes say to myself when the house lights go down and John Douglas Thompson walks out on stage. It’s an exhilarating sensation, one completely unlike seeing a book that you wrote in a store or on a shelf, and it doesn’t get old, at least not for me. The interview appears in today’s Journal, and you can read the whole thing here. If you’re interested in how actors, writers, and directors work together to bring a play to the stage—and how they respond to the “input” of live audiences—you might want to take a look. 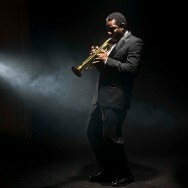 Satchmo at the Waldorf is nearing the end of its off-Broadway run at the Westside Theatre. The final performance will be on Sunday, June 29, at three p.m. If you’re counting, that adds up to a four-month New York run—18 previews and 136 performances. Not too shabby for a novice playwright who never expected his first play to be performed anywhere, much less in Orlando, Lenox, New Haven, Philadelphia, and New York. I’m infinitely grateful to John Douglas Thompson, Gordon Edelstein, and my other wonder-working colleagues who made it possible. I should add that we’ve had numerous inquiries from other cities, and that we expect the play to be performed elsewhere in due course. According to the press release announcing the closing, “Future productions are planned for San Francisco, Chicago and London.” I’ll say no more for the moment, but…watch this space. In the meantime, go here to order tickets for the remainder of the New York run. Don’t wait—time is short!